It’s always intimidating cutting into a car’s sheet metal. But when it’s your first time ever doing it, it can be downright scary. However, this was something I grew accustomed to; the 1989 BMW 325i E30 that I purchased for $1,800 five months ago hit me with a shocker the moment I began working on it: It had rust, and lots of it. In my last update, I finished welding up the rust holes on the left side of the car. During this time, I learned which rust repairs were within the realm of my welding abilities. This resulted in me gaining the confidence to dive right into the rear and right sides of the car. From the prior update’s rust battle. 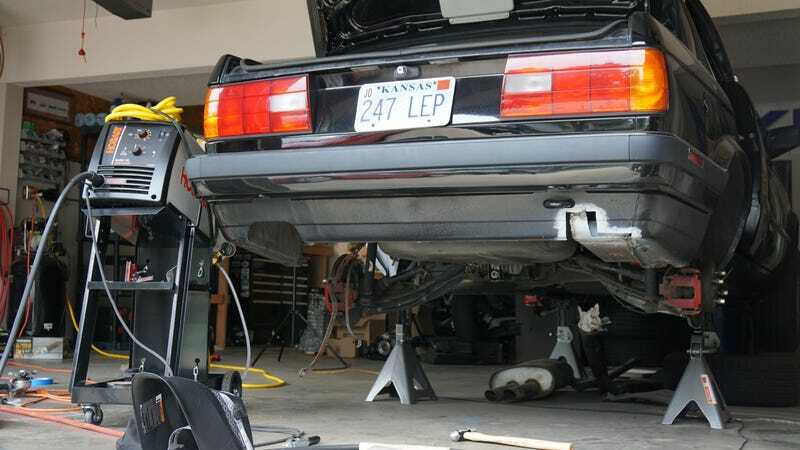 The second half of the rust repairs on my E30 project did go smoother than the first, but that’s not to say there weren’t still some challenges to overcome. The first area to address was the rear valance, which had a sizable hole developing in the bottom right corner. This was most likely caused by battery acid pooling in that corner of the trunk to the point where it finally rotted the metal all the way through. While assessing the damage, I found that this was going to be a more involved repair than it appeared from the outside. That’s because the rear valance panel, where the taillights and bumper mount, is spot welded to an interior compartment which houses the car’s battery. Both of these metal structures were considerably rusted. The first job at hand was to grind away the valance panel to observe how much of the interior panel would need reconstruction. After some grinding and cutting on the valance panel, I could finally see the extent of the rust on the interior battery support panel. It had degraded significantly in the bottom corner. This proved to be a difficult panel to work on with the rear valance in place, but I gave it a shot anyway. I went in with an angle grinder and did my best to cut the rusted metal from the interior support panel. Once satisfied that the rust was removed from the interior panel, I mocked up a patch template from card stock. Using the template, I cut out the actual patch panel from sheet metal to reconstruct the missing corner of the interior battery support. The resulting patch may look crude, but it won’t ever be seen and will certainly do the job. With the battery support panel fixed, it was time to move on to fixing the valance panel. At first I thought I could just create a single-piece patch panel to fill in the “L” shaped hole. However, the body line that ran right through the middle of the hole made me rethink this idea. Instead, I decided to make three separate patch pieces and tack them together to close off the hole. This approach allowed me to more accurately replicate the body line as well as recreate the curvature needed at the bottom edge of the valance panel. How did I go about creating the needed curvature? I beat the panels into shape with a hammer after I tacked them in place with the welder. Hey - it worked. From there, I filled in the remaining gaps between the valance and the patches with additional welding tacks. To finish the area off, I sanded the welds smooth with a belt sander. The end result wasn’t too terrible! The next area to address was the gnarly rust hole in the right-side rocker panel. The hole had developed where the rocker panel and rear quarter panel seams met and was disguised by the rubbery chip guard paint that supposedly “protects” the entire lower section of the car. Unfortunately, all the rubbery paint did was create a perfect environment for the rust to grow unnoticed. I could see that there was a soft spot under the chip guard, and upon prodding it with a screw driver, I found there was a large rust hole present - great! Repairing this area was fairly straight-forward. I cut out a rectangular piece from the rocker panel that fully encompassed the rust. I then made a template from card stock for the resulting rectangular hole. The hole had an inward bend at the bottom which I would need to replicate in the resulting metal patch. I traced the template onto a fresh piece of sheet metal and then cut the metal out to shape. From there, I carefully reconstructed the bend in the patch panel by placing it in the bench vise and slowly bending it to shape by hand. No fancy metalworking tools here! I test-fit the patch panel in the rocker’s hole, all the while working the patch’s lower radius until it was similar to the contour of the rocker panel. Once I felt it was close enough, I tacked the patch into place with the welder and followed it up with a solidifying weld bead around the perimeter of the patch. Sanding the welds smooth with the belt sander saw the rocker whole once again. The final rust areas to address were the numerous holes in the right-rear wheel wheel. Most of the holes in this location were caused by a metal shroud mounted to the exterior of the fender well. The shroud helps protect the exposed fuel tank vent hoses, but it also catches water, mud, and debris slung up by the rear tire ultimately leading to rust issues like this car had. I must say, BMW dropped the ball on the routing of the fuel tank vent hoses on the exterior of the fender well. Hoses carrying gasoline vapor being placed in the direct debris path of one of the drive wheels seems like a poor design choice. But hey, what do I know? The “protective” shroud had completed rusted away on this car, so the vent hoses were left completely exposed. I spent a while trying to determine how best to repair this problem area. I started out thinking of just patching the rust holes and keeping the fuel vent lines traveling the length of the exterior wheel well. But then it hit me—that’s just not a great design. View from the wheel well. Instead, I decided to route the fuel vent lines through the trunk and have them exit right next to the fuel vapor reservoir that’s located in the rear of the fender well. By moving the hose exit point to the rear of the fender well, it would allow the vent hoses to be completely protected from tire debris, while at the same time, eliminating the potential for mud-collecting areas that lead to rust. To accomplish this, I grabbed a section of steel pipe to serve as the new exit point for the hoses. I then marked out an ellipsoid-looking hole in the rear of the fender well so that the pipe could be welded in at an angle. At this point, I was committed to this new design. I grabbed the angle grinder and went to town on the fender well. With the ellipsoid-looking hole now present, slipped in the pipe into place and welded it in. The view from inside the trunk. With the exit pipe for the fuel vent hoses welded in, I then proceeded to weld up the remaining rust holes in the fender well with patch panels made to fit. The next part of my new fuel vapor hose routing “design” was to create a flexible conduit for the hoses to travel through. The purpose of the conduit was to ensure that outside air would be kept separate from the interior air of the car. It would also create a physical protective barrier for the vent hoses. This mission of creating this conduit was achieved by running to the hardware store and finding a rubber hose with an inner diameter large enough to fit over the end of the new exit pipe. Once I located a rubber hose that fit the bill, I ran the vent hoses through it. To complete the system, I used hose clamps to secure the conduit to the vent hoses’ metal entry and exit pipes. With the patches welded in place and the vent hoses successfully rerouted, I applied some protective rubberized undercoating to finish off the revised wheel well. The end result may not be the prettiest looking thing around, but it probably won’t ever be seen anyway. It works great from a functional standpoint, and that’s what matters to me. Thankfully, this repair marked the end of the rust issues for this car. I never thought I’d pull it off, but I’m happy to report there are now no more unexpected holes in the bodywork. I know I’ll never get a return on the time and money I spent undertaking all these welding jobs. I understand that I would have been better off scraping the car and picking up a rust-free shell from California. But guess what? The satisfaction I’ve gained from piecing this decrepit old sedan back together is difficult to quantify. A car that was destined for the scrap heap is whole once again. Now the project’s momentum is back in my favor and the once unfamiliar territory of rust repair is part of my repertoire. From this point forward there will be a host of repair jobs that I’m more familiar with—the mechanical stuff. Or at least I think so. Stay tuned, as I’m sure this BMW has a few more surprises up its sleeve.